A Nation whose government takes La Niña occurrences as serious quasi-periodic threats and seeks to enact policies to protect its citizens, their livelihoods, and properties—both public and private–can be considered a La Niña-ready nation (LNRN). A common misguided idea about La Niña is that the impacts resulting from its occurrence are the opposite of its counterpart, El Niño. For example, where there was a drought during El Niño there would likely be floods during La Niña. 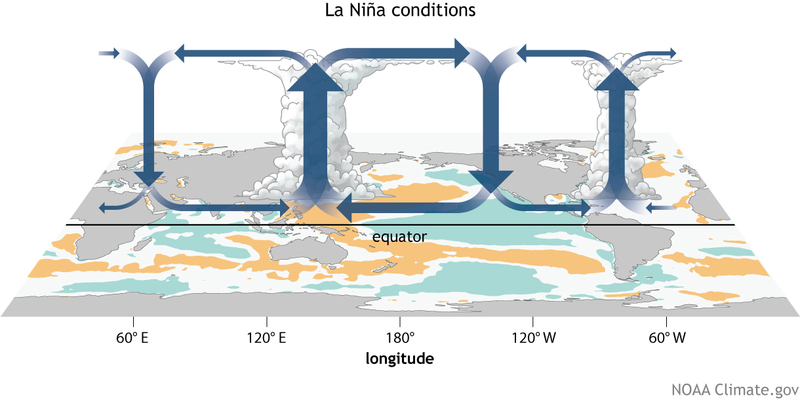 This, however, is inconsistent with the records showing that La Niña’s impacts, as do El Nino’s, vary because of changes in other oscillations in the atmosphere and oceans (Indian Ocean Dipole, Madden-Julian Oscillation, North Atlantic Oscillation (NAO), Pacific Decadal Oscillation, (PDO)) among others influencing the severity of the impacts worldwide. Governments that prepare for hydro-meteorological hazards that would seasonally occur (e.g. rain, drought, mudslides, flood, fires, etc.) is on the path toward becoming La Niña ready. Steps toward being prepared to survive during ENSO neutral periods set the framework and infrastructure needed to be able to react to more extreme conditions.